Mizu, a color term for "light blue," translates to "water" and is unique to Japanese speakers. U.S. English speakers have no commonly used equivalent. COLUMBUS, Ohio – If a Japanese woman were to compliment a friend on her flattering pale-blue blouse, she’d probably employ a word with no English equivalent. “Mizu” translates to “water” and has emerged in recent decades as a unique shade in the Japanese lexicon, new research has found. Researchers from Japan and The Ohio State University collaborated on the study, which examines the color lexicon in Japan over time and compares the country’s modern color terminology to words used in the United States. The study appears in the Journal of Vision. The researchers asked 57 native Japanese speakers to name the colors on cards placed before them. The study participants used 93 unique color terms. No modifiers such as “light” or “dark” were allowed. 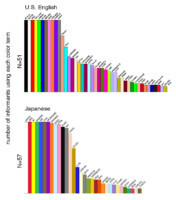 Identification of basic long-standing color terms came as no surprise, but the use of “mizu” by almost everyone in the group is new and strong evidence that it should be included among 12 generally accepted basic Japanese color terms, the researchers concluded. Furthermore, they found differences between color language in the two modern, diverse societies. Some unique and commonly described color terms in one language are missing in the other. In Japan, “mizu” is one, as is “kon” (dark blue.) In the U.S., native speakers often use the words “teal,” “lavender,” “peach” and “magenta,” none of which has a commonly used Japanese equivalent. “Like animal species, language is constantly evolving,” said Ohio State’s Delwin Lindsey, a professor of psychology who worked on the study with optometry professor Angela Brown and Japanese colleagues from several institutions. “In America, we don’t have a single unique word for light blue. The closest thing we have is “sky,” but when we ask, we don’t elicit that very often,” Brown said. Lindsey and Brown said the study of color language goes beyond how we describe a blouse, car or crayon. “We’re interested in how colors are represented through language and how that gets distributed through society. How is it that we all decide that blue is blue? We do so through interaction,” Lindsey said. The color lexicon happens to be easier to study than other aspects of language evolution. Colors are easily described, reproduced and displayed. And there is vast difference in what colors we use from culture to culture and individual to individual. “People around the world have very different color-naming systems and that raises interesting questions about what we’re born with and what’s strongly contingent upon our culture,” said Lindsey, who teaches at Ohio State’s Mansfield campus. “In general, the more basic the color terms, the less technologically and economically advanced the culture,” he said. The study was supported by the National Science Foundation and the Research Institute of Electrical Communication at Japan’s Tohoku University. Ryan Lange, now at the University of Chicago, worked on the study as a graduate student in Ohio State’s College of Optometry. CONTACTS: Angela Brown, 614-292-4423; Brown.112@osu.edu. Delwin Lindsey, 419-755-4359; Lindsey.43@osu.edu. Though most everyone sees color the same, people in different parts of the world have different names for different shades. New research from Ohio State shows changes in the Japanese color lexicon. The U.S. colors are from previous work.